To the surprise of many commentators and scholars, a bloc that bears very little cultural similarity and is not tied geographically, has emerged as the most formidable rival to the current economic order. The announcement for the establishment of a New Development Bank and a Contingency Reserve Arrangement (CRA) under the aegis of BRICS holds the potential of tilting the economic order of the world in favor of these emerging economies. However, this development begets the question that despite existing multilateral financial institutions such as the World Bank and IMF, why do we need another development bank and a rivaling monetary arrangement? Before embarking upon an analysis of the factors that have resulted in the creation of the BRICS Bank and the CRA, one must have a theoretical understanding of why states create multilateral organizations. In this regard, the seminal work of Robert Keohane – co-founder of the neoliberal school of thought – on this important field of international relations may help in throwing light on the issue. Keohane’s theory of institution making suggests that institutional creation is a result of market failures. While this may hold true in the case of BRICS, it isn’t the sole reason for creation and constitution of the BRICS Bank. Much of the realist analysis with respect to creation of international organizations focuses on the interests of developed powers, who change or modify institutions in order to overcome problems of collaboration and coordination. To this extent, there isn’t any proper analysis on creation of international institutions by developing countries. However, institutionalist theory, as developed by Keohane, informs us that states create institutions to achieve gains from cooperation in the future. The IMF and World Bank were built upon post-war ideals, wherein greater economic cooperation would allow for lasting peace in the world, and development of post conflict regions and developing countries. However, notwithstanding the immense value this system adds to the global financial system and development processes, the cooperation gains for many developing countries has been sub-optimal. A sub-optimal result from this cooperation propels two likely scenarios. The first scenario pushes for reforms within the existing institutions, as is the case with the proposed IMF reforms. The second scenario, is based on a cost-benefit analysis and certain severe circumstances, which necessitate the creation of new institutions. As argued by Professor SaGuimaraes at the Institute of International Relations at University of Sao Paulo, if there is a radical shift in the distribution of power or burgeoning difficulties in yielding cooperative results, states may forego the cost of maintaining an existing institution in lieu of creating a new structure with a new set of rules, which allows them to attain a pareto optimum result i.e. a situation where the interests of one state would be better addressed at the cost of at least another state’s interest . In essence, institutional change may be the combined result of external shocks, inefficient outcomes and internal coordination problems or can be initiated solely on basis of one of these factors. Traditionally, this move has been exercised by developed countries best evidenced through creation of international tribunals with overlapping mandates for the purpose of forum shopping. However, redistribution of the economic power equilibrium as an aftermath of trade and investment liberalization coupled with the global financial crisis of 2008 has allowed developing countries to express their discontent with the status quo much more vehemently. The BRICS emergence on the geopolitical stage is not only an embodiment of frustration with the current world order, wherein a hegemonic system has stifled the growth of many economies, but also a collective desire to tweak existing systems and structures in favor of higher economic growth in their respective regions. Following the political and economic reforms in these countries, the BRICS Bloc has recorded high growth and is poised to become a formidable “adversary” to the existing economic order. For example, the share of these countries collectively in world trade stood at 3.6 per cent in 1990 and rose to over 10 per cent in 2010. Further the share in global GDP stood at 10 per cent in 1990 and crossed 25 per cent in 2010. Even in terms of foreign exchange reserves the Bloc had little over 10 per cent in world share in the 1990s, which increased to 40 per cent in 2010. Moreover, increased market size of products and services with infrastructural developments has made the BRICS an attractive destination for Foreign Direct Investment. The total inflow of FDI in 2013 for BRICS stood at $322 Billion. Among the Bloc, India and China have also developed a robust outward FDI outlook and are competing with the top foreign investors from across the world. Even though the growth of these economies has slowed down in the past couple of years, they remain a force to reckon with and are becoming increasingly aggressive in terms of their economic agenda. The global financial crisis and the ensuing sluggishness in economic growth in the developed region of the world has also allowed these countries to attract investments and provide the much needed stimulus for global economic growth. The decreasing clout of the G-8 paralleled by the rise of the G-20, the Next Eleven and the BRICS has further enhanced the potential of the BRICS to become a potent and charismatic concept for the Global South – as a bloc that will usher in a new era of global financial dynamics and diminish the western monopoly on larger financial issues. Thus, it can be readily argued that the sudden restructuring of power dynamics coupled with the volatility of the global financial system, as exposed in 2008, has played a significant role in the formation of the BRICS Bank. The conditions put in place by IMF and World Bank in their transactions in conjunction with the unequal shareholding and voting structure extant in the system has been the cause of much grief for all BRICS countries. Professor SaGuimaraes notes that the reforms in the IMF and World Bank quota system have had different timings and implications but have shared historical connection since IMF reforms necessarily results in changes at the World Bank. He further notes that since the inception of the Bretton Woods institutions (the IMF and the World Bank were created at the 1944 Bretton Woods conference) quotas have been changed to favor just a few rising economies such as Japan and Saudi Arabia, while others have been ignored despite their growing importance in the global financial regime and discounting the rise in their respective GDPs. The growing frustration of the BRICS bloc with the politicking that is delaying the proposed 2010 reforms is reflected through numerous statements made at various BRICS and G-20 summits coupled with representations before the IMF/World Bank annual meetings. Needless to say, very little has been done to accommodate the interests of these countries and an official declaration on July 9, 2014 observed that such coordination problems can only be dealt with by creation of the New Development Bank and the CRA to show that the BRICS is not dependent of the Bretton-Woods anymore. Thus, the various political and bureaucratic hurdles in the IMF/World Bank structure have also prompted the creation of the BRICS Bank and the CRA. It must be noted that the redistribution of power is only going to tilt further in favor of the BRICS economies given their combined growth trajectory and the creation of these financial institutions has already found support among many members of the Bretton-Woods. 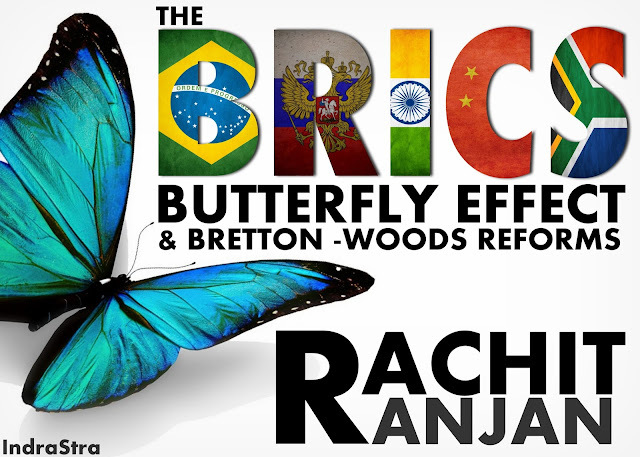 As the BRICS leaders prepare to meet in Russia for the 7th BRICS Summit, it would behoove the Bretton-Woods and developed countries to consider how they can become a part of this change in order to minimize the shocks on their respective economic clout. A starting point would be to expedite the reformation process and perceive the BRICS Bank and CRA not as competitors but as institutions, which can complement the role of IMF/World Bank. The credibility of the Bretton-Woods has diminished for the BRICS, yet the Bloc is aware of the importance of the IMF/World Bank in the global financial governance regime and will continue to make attempts to push for reforms within these institutions. However, the IMF and World Bank must also take into notice the potential of these institutions to usurp their functions and operations on a global scale and must eschew the political stranglehold in order to initiate the reformation process with immediate effect. The views expressed in this article are the author's own and do not necessarily reflect the original publisher's editorial policy, neither of us.